You should practise basic safety drills, such as clearing your mask and regulator mouthpiece, whenever you can. Both are essential skills, and a swimming pool is the ideal place to practise them. 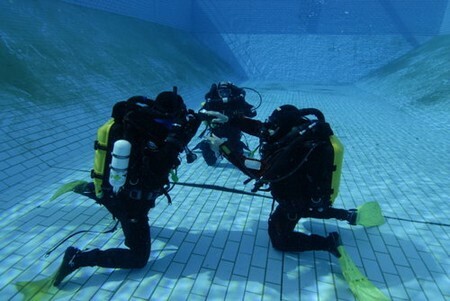 If you are a member of a diving club, there are usually pool sessions once a week. Removing and replacing a mask successfully underwater is one of the most difficult tasks that a new diver has to learn. There seems to be a psychological barrier to overcome, which is probably a result of the mammalian reflex that tells you to hold your breath when you feel water on your face. The trick is to do it in easy stages. Start by lifting the skirt of your mask to let a little water in and then blow the water out with air from your nose. When you are confident with that stage, try half-filling your mask and clearing it. Do not remove your mask underwater until you know you can clear it easily and even then, for the first attempts, try submerging from the surface with your mask in your hand rather than taking it off when fully immersed. Eventually, you will be able to take your mask off completely and swim around the pool, breathing with your regulator. You will be amazed how competent you become. The swimming pool is the ideal environment in which to practise swimming with neutral buoyancy because it is more difficult to do in shallow water. You will have been taught during your first wet lessons how to do fin pivots. Time underwater in the pool allows you to become totally familiar with your equipment. It is worth experimenting with different ways of rigging it. You can practise taking it off and getting it all back in place while you are still submerged. This may not have any practical application when you are diving but it helps build your confidence. Another good exercise is to try breathing from a free-flowing regulator. You do this by tilting your head to one side to allow excess air to escape and pushing the purge button fully to simulate an uncontrolled flow of air. Practise emergency swimming ascents by swimming horizontally, one arm outstretched, while you exhale from your mouth all the way. Make sure you keep your regulator in your mouth in case you get it wrong! A simulated swimming ascent is best done horizontally because it removes the hazard of pressure changes as you go up. Remember to never hold your breath while breathing compressed gases. You should wear a thin wetsuit when you practise. It will give you a more accurate idea of what it will be like on a dive. If you practise in a new drysuit in a warm pool, be aware of the problem of overheating. You should be careful how you handle your equipment in a swimming pool, especially when getting into the water and out again. Always use the ladder and never walk around poolside while wearing your fins. Make sure that there is a responsible person with rescue skills supervising your pool sessions.